I have pictures of him sitting on the glass coffee table; or the one on the balcony next to the porch swing, I have anther of him sitting on the desk with my old glasses and journal and my favorite fat pen. 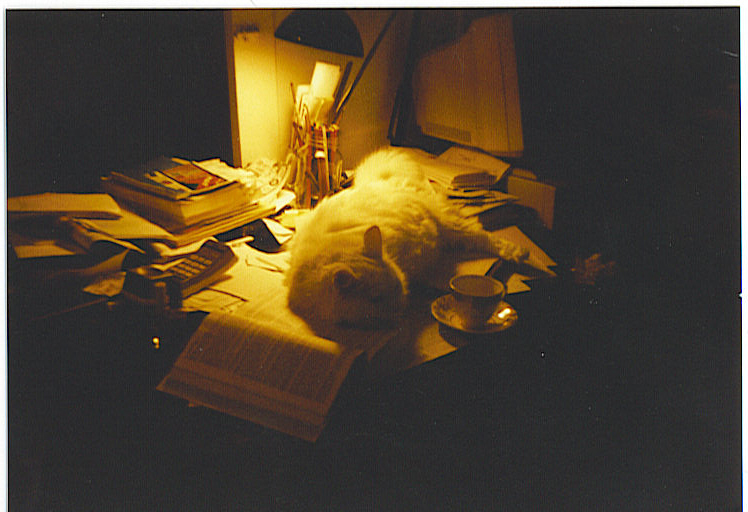 I have another one sharing space with cat Sabrina on my all-to-cluttered desk late at night lit by an old lamp. He filled with a little Texas tea and my cat deep in slumber my only company as my pen races the dawn that heralds a new day’s duty and bustle of the necessaries that take me from this, my aerie.